Have you ever had a cold or a flu where you just felt exhausted and low even though your physical symptoms weren’t really that bad? Maybe you just wanted to sleep all the time, or everything felt kind of emotionally flattened and depressing. If you’ve ever felt like that, you’ve felt the power of inflammation to change your mood. But did you know that a lousy diet can have a similar effect? If you don’t know what inflammation is, go here first for a quick primer. Inflammation is a normal and necessary part of the immune response, so it gets turned up when you’re sick. On top of fighting the bacteria or virus or whatever else, inflammation also makes you feel tired and a little depressed, more motivated to take it easy and maybe skip the gym that day. That’s good: it helps you get better! But ideally, inflammation would do its job and then go away. 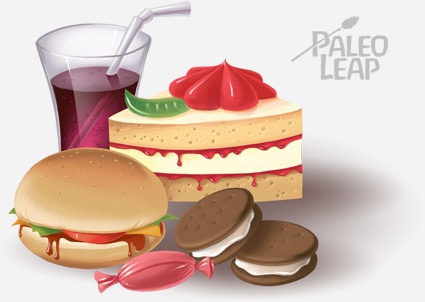 From a Paleo perspective, the problem with the modern diet is that it’s constantly provoking inflammation. Sugar, industrial seed oils, refined carbs, gut irritants in grains and legumes, and trans fats are all inflammatory – and that has consequences for mood and mental health. It’s pretty well-documented by now that inflammation is huge in psychiatric diseases. Patients who are diagnosed with depression and bipolar disorder have higher levels of inflammation, and anti-inflammatory supplements, like Omega-3 fats and antioxidants, are promising therapies for depression. In this study, researchers took 20 young and healthy men. They activated the men’s inflammatory immune response by injecting them with salmonella endotoxin. This significantly increased inflammation, as measured by inflammatory markers including the stress hormone cortisol, IL-6, and TNF-alpha. The higher the men’s inflammation levels were, the worse their symptoms got. This wasn’t a study on any psychiatric diseases like “Major Depressive Disorder” – this was garden-variety bad moods and feeling down. Here’s another study. 30 healthy men were injected with one of two things: either a placebo or a substance designed to increase inflammation. Neither group had any physical symptoms of illness. In the inflammation group, there was a significant increase in IL-6, a marker of inflammation. Those subjects also had significant “negative changes in mood” that correlated with IL-6 production. In other words, the more IL-6 they produced, they more depressed they felt. Other studies on animals have also shown that artificially producing inflammation causes so-called “sickness behavior:” the animals sleep more; they get lethargic and act “depressed” (as much as a mouse can be depressed, anyway). How does Inflammation Affect Mood? The inflammatory cytokines produced during this inflammatory response have a direct effect on neurotransmitters in the brain. In particular, they decrease serotonin levels. If you’ve ever heard someone explain depression as a “chemical imbalance,” serotonin was probably the “chemical” they were thinking of – many modern antidepressants are aimed at increasing serotonin in the brain. But did you ever wonder why some people have that “chemical imbalance” in the first place? Where does it come from? Why does it sometimes show up at different points in a person’s life? Inflammation might be the answer. Inflammation also affects the HPA axis, which is responsible for hormones like cortisol. That may be one reason why it often causes fatigue or sleepiness: out-of-whack cortisol rhythms typically make people exhausted during the day (especially in the late afternoon) but leave them struggling to fall asleep at night. But the obvious follow-up to that is “what causes the inflammation?” – inflammation doesn’t just show up out of nowhere any more than serotonin imbalances do! Take a look below at where inflammation can come from – sometimes it’s adaptive and helpful, and sometimes it’s not. In all of these cases, it’s very helpful to slow down and rest. Your body can heal itself from all these problems, but it needs you to slow down, avoid any new and stressful situations, and eat some chicken soup. Depressive symptoms of inflammation are perfectly adaptive if your inflammation comes from a one-time injury or disease, because the depressive side effects actually help you heal. But what if your inflammation is actually from diet? Is an Inflammatory Diet Affecting Your Mood? Unfortunately, bed rest isn’t a solution to a bad diet. High in industrial oils like corn oil, soybean oil, and canola oil. 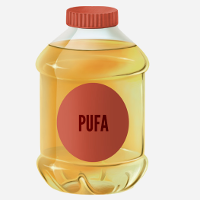 These oils contain a lot of Omega-6 fats, which are inflammatory in high doses. Low in anti-inflammatory nutrients like antioxidants and Omega-3 fats. This kind of diet basically creates a constant, low-level inflammation all the time – is it any wonder that so many people stagger through the day feeling tired, dissatisfied, vaguely unhappy, and constantly needing caffeine boosts to keep them going? In this case, the inflammatory “depression” isn’t adaptive. Resting and slowing down won’t help. The solution isn’t rest; it’s to stop eating the inflammatory food. High in anti-inflammatory nutrients like antioxidants and Omega-3 fats. If you’re eating Paleo, you’ve already got those things down without really thinking about it. Even leaving aside diagnosed mental illnesses, inflammation has a huge and immediate effect on general mood, energy, and well-being. If you’re inflamed because you’re sick, this is adaptive: it’s motivation to rest and recover. But if you’re inflamed because your diet is lousy, resting won’t solve the problem! The solution is to eat an anti-inflammatory diet and get rid of that inflammation right at the source. What is Inflammation, Anyway, and Why is it Bad?